Despite my recent spate of Middle Ages (and middle aged) book buying, I recently became sidetracked reading U.S. Grant's memoirs, and decided to set up the Battle of the Wilderness scenario from the highly regarded Grant Takes Command, a board game in the Great Campaigns of the American Civil War series. I actually have four games from this particular stable, but had never played any of them. I set up the board, admired the pieces, consulted a few sources to work out the historical troop movements, and started to play. Well, to cut a long story short, I got through four activations and then packed it all in. The interest wasn't there. And this is what happens all the time when I set up a board game. I don't quite know why it is, but playing board wargames against myself is just not all that much fun. It's not a nice thing to admit given the contents of my game room, but there it is. There are exceptions, but basically, the action doesn't seem important and it's not enjoyable. I love board games against other people, and I enjoy games over VASSAL, but repeated experiments have shown that no matter how interested I am in a topic, there is hardly a game in my collection that two or three nights set up on the hobby table with only myself for company will not make me want to put away. One always lives in hope that next time it will be different, or that an enthusiast will move in just down the road, but the become excited, set up, leave a couple of days, take down pattern has become so ingrained it's almost Pavlovian. With a big and expensive move coming up later this year I suspect I'm going to have to do some thinking about whether all of these games are really worth hanging onto or not. On the plus side, there's no such problem with my miniatures collection! Interesting. I do boardgames both face to face and solitaire and if it is a system I like, I enjoy playing 2 player games solo ....providing the system has solo friendly mechanics i.e. nothing prevents solo play. on the other hand, I do not particularly like to play boardgames that are actually designed for solitaire play, I just don't like playing against the system and artificial AI. You might enjoy boardgames that use a chit draw activation, so that as the solo player, you never know which formation of which side will activate next. I am however starting to stick with boardgames that are part of a series, to reduce the 're-learning' of rules each time I pull a game down. I figure increased familiarity with a rule set will hopefully give me more rewarding game play. Perhaps this is already happening with your figure play but not boardgames and that's why they feel less enthralling. Games with chit activation work very well for solo play. Opposed activation rolls work well to to mix up the player sequence and add a bit of predictability. On balance, I find most games can work for solo play and can be quite enjoyable. Good evaluations, Norm and Jonathan. Most of the board games I enjoy solo do use either cards or chit pulls, funnily enough. They are also playable in an evening, fairly broad-brush, and have simple rules but reasonably deep gameplay. I think that realisation might just be important! When I started playing boardgames, age 12, pretty much the only ones available were from Avalon Hill: Gettysburg (hex version), Stalingrad, Afrika Korps, Waterloo, and D-Day. (Yes, I realize this indicates just how old I am.) They all used the same basic system, were well-balanced, and fun. I literally knew NO ONE else who played these, so I played against myself, probably hundreds if not thousands of times, for many years. I did the best I could for both sides, and as a side benefit, got really, really good at unit vs unit tactics, as it was not possible to come up with surprising over-all strategies. What Norm writes about takes me back to those days--I still remember the joy at opening a new war-game--and have begun playing boardgames against myself again. The key for me is simplicity and short game length. Hi Chris, yes, I did the same thing with Diplomacy (I know, it shouldn't be possible, but - in my defence - I was about fourteen!) and, later, Napoleon at Waterloo. More carefree days, perhaps? I know it seems to become harder to get near the thrill of those early experiences as we get older. I see and feel for your problem, games are better with friends! Hole in one there Fran! Back to New Zealand is the plan. Aaron, I have periods where I experience exactly the same situation! I get excited about a board wargame, lay the map out on the table, set up the hundreds (or thousands) of counters into their starting positions, admire the map with pieces deployed, maybe push counters around for a turn or two, leave it out for a while longer, and pick the whole thing up, discouraged. Not a very productive exercise! On top of that, I often set up the whole enchilada rather than a small introductory scenario. What I find works for me is to fight the urge to setting it up and then taking it down after only a few days. I have had better success playing the game out over a longer period of time. I might get bored or tired at first having put in the big effort in setting up the game. The temptation to pack it all away is great at this stage. Instead, I fight that urge and leave the game set up with plans to return to the game when that itch to play returns. This way, a turn or two can be played in one session and turns can be tackled in this fashion over a long period of time when I am fresh at the beginning of each session. Once I develop a mental historical account as the game progresses, my interest increases and the urge to pack it up prematurely often disappears. Of course, one must have the space to leave a boardgame out longer term, though. Hi Jonathan, that sounds like a good way to get around the issue: plan for it, and combat it! That might be the way to go in future. Cheers! I've found the same problem. The real answer for me has been to read an account of the battle in conjunction with playing the game. The game puts the reading in a different light and the excitement of the book helps keep my interest in the game. The sad answer is that often I turn to video games these days instead. There's just something about the physical board and pieces that still excite me and that a video game can't recreate. I didn't realise so many people have the same thing happen! It's quite nice to see that it's not just my own make up that's at fault :) I completely agree that books are so often catalyst and companion for those of us who pursue this hobby! Cheers, and hope things are going well on the painting front. I played boardgames almost exclusively for about 10 years (1985-95), mostly multiplayer. I played a few small games solo in 2000 but then slowly built up my minuatures collection and have played almost all minis since 2009. Everytime I think about playing a boardgame solo, I just think about getting out the miniatures instead as they look better! The minis have nearly always won. I have been collecting the odd game here and there over the last 20 years and am now panicking that I will never get around to playing them - solo or FTF :-( The good news is I am less caring than I was 10 years ago about playing them and have even got rid of a couple I know i will never play. I just need to cull the other 100 or so! But for 2017 I have comniited as part of a 6x6 challenge to play at least two boardgames 6 times: Fall of Rome and Field Commander: Alexander - the latter I believe i owe you a description of what i think of it. If I don't get around to playing any of these, then I know that most of the rest of my boardgames will have to be "doomed" to be played by someone else! And I am curious too on where you are moving to. Hi Shaun, I've seen others doing that 6x6 challenge recently, and it does seem a fine way to get yourself started in (or returning to) a game. Fall of Rome sounds like a good one. I have Solitaire Caesar, which seems to be similar, and do really enjoy that one. I didn't like Field Commander Rommel much at all, so will be interested to hear your take on FC:A when the time comes for you to post it. Thanks all for the comments. You've made me feel much better! We all suffer from a similar affliction, it seems. Yes, so it seems! I'm quite surprised how common it seems to be. I guess we all treasure odd things in our lives,i most certainly do being very eccentric in my ways. If you decide to downsize your Games,think of others and give them away. Solo plays for non-solo boardgames have a bit of problem that is not so heavily present in the miniature games (at least the ones that I play). Most of the board games have some degree of hidden element that spoils the fun. Even when the information is open, there is some degree of secrecy that needs to be maintained, while in miniature games the forces can do only certain, expected things. Or in case of Age of Sail games, or Ancients, I think that the battle resolution is only modest slugfest and extension to the deployment and maneuvering where the real tactical competence would count. I once thought that it would be interesting(?) to resolve battles where generals take part only on the level they realistically can (in ancient setting, that would be rather little besides of the deployment), and then let the game master to do the battle resolution in miniature games. 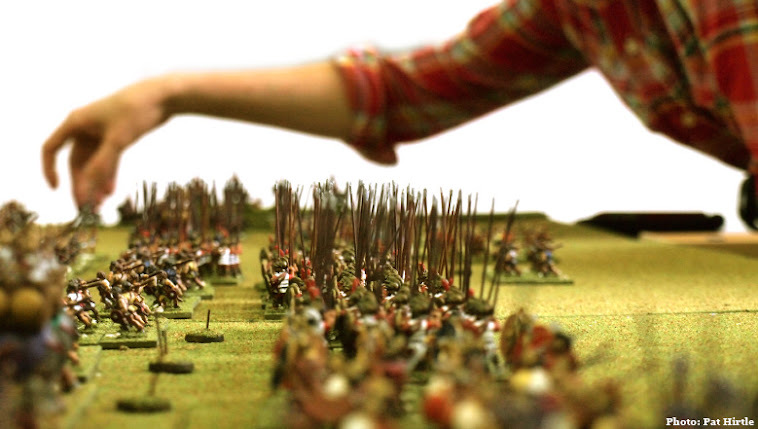 Against that thought, the miniatures battles appear more to single battle resolution than anything more, while boardgames often have the "more" included. Did that make any sense at all? Yes, I think I see what you mean. Miniatures games are more straightforward, whereas boardgames require a certain amount of surprise, with the surprises coming from sneaky plans as much as from concealed units or special hidden effects. Also, certain types of games are more a case of carrying out what has been preordained by the position or the tactical situation, and as such are more suited to solo play, because they almost play themselves. Your penultimate paragraph is actually why I like Lost Battles for solo play - a lot of the decision-making is made for you by the situation. There are a few key moments per game when you need to really put on a commander's hat, but even these decisions can be automated if you so wish. Thanks for your comment - very interesting, and (assuming I've understood you correctly) I agree with you! Cheers, and thanks for dropping by! Put aside an hour a day to play the game so you will keep at it. Just remember: playing against yourself you have a perfectly matched opponent! I have to agree, that even with miniatures games, the real appeal for me is in the interaction with other human beings. On the other hand, when playing against myself, I'm finally in the company of someone I have a real chance of beating! I know what you mean about big moves. At some point in the future I will be facing from Tokyo to Vancouver- a fearsome prospect after having spent 25 years here. Haha, yes, there is the attraction of being able to claim a win! I know, the idea of moving is very daunting. So much stuff, and so far to move it! Wow - a lot of responses. I'm on board w Norm. I've culled my collection significantly from 7 storage bins down to 3 ( 2 of which are ASL). The vast majority of my gaming is solitaire, taking both sides and working out the best move for each. It's fun for me but it lacks a certain tension that you can only get by sitting down and playing against another brain. On the other hand, it's a good way for me to have some alone time after a long day of dealing with people. I hear what you're saying though! Thanks for dropping by, and I hope you find something here to enjoy. I'm an ESL teacher who lives in Japan and I keep this blog to record my wargaming activities. I also quite like books, cricket, music and rugby, so these topics may also pop up from time to time. Again, I hope you find something of interest, and please feel free to leave any comments you wish. The layout here was done by my mate Nige over at the fishingnews.co.nz. If you like fishing at all, go and take a look at Nige's blog. There's plenty of good reading material there. Five minute Punic War rules. Lost Battles after action report wiki (AARs from around the web). Brookhurst Hobbies, where I get most of my Xyston figures. Magister Militum, home of Chariot 15s. Wayland Games: New Fantasy Flight Games Star Wars: Legion The Clone Wars Pre-Order Launched! Club Night 18/03/19: 20mm IABSM, France 1940 – Motorbiking! Hi, I'm alive and not a 'Bot. Last Chance for Victory (MMP) - "7.9 The Best Three Hours..."
Champion of all Scotland !! The English Civil War in 6mm. Prufrock's painting guides: 15mm Republican Romans. It's been one of those weeks. Thank God it's a Friday!